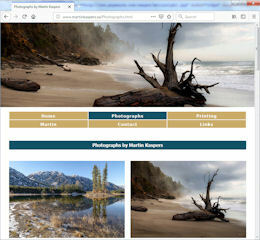 Martin Kaspers is an award winning photographic artist who produces photographic prints and giclees for himself and other photographers and artists. 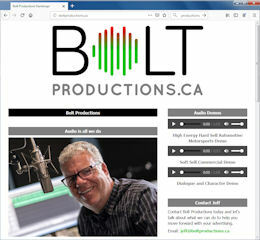 Bolt Productions offers full commercial production and voiceover for radio, television, podcasting and other web media. 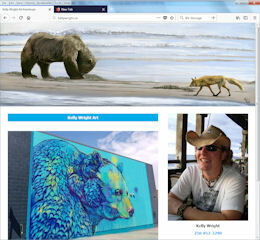 Kelly Wright is a mixed-media artist who uses bold bright colours to create murals, canvas paintings, and body art in Kamloops, BC. 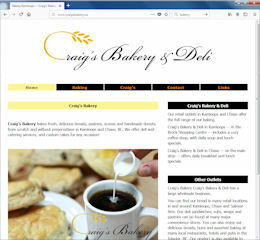 Craig’s Bakery bakes fresh, delicious breads, pastries, scones and handmade donuts, from scratch and without preservatives in Kamloops and Chase, BC. 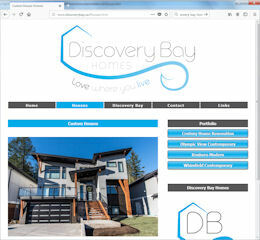 Discovery Bay Homes is a small custom home builder and renovator specializing in home building, renovations and maintenance in Victoria, BC. 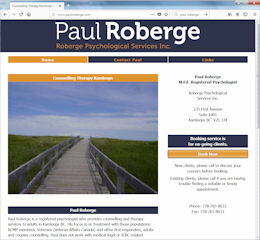 Paul Roberge is a registered psychologist who provides counselling therapy services in Kamloops, BC. 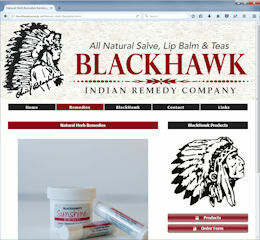 BlackHawk Indian Remedy Company manufactures Natural Herb Remedies including BlackHawk Sunshine Ointment, Lip Balms and Herbal Teas in Kamloops, BC. 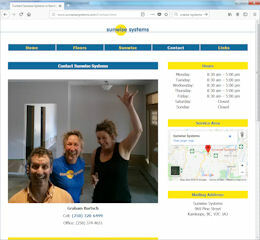 Sunwise Systems makes decorative concrete floors for businesses and homeowners around Kamloops, BC. 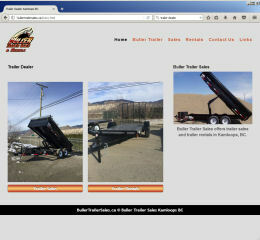 Buller Trailer Sales offers trailer sales, trailer rentals, and trailer parts in Kamloops, BC. 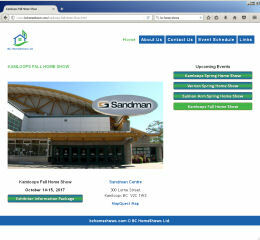 BC HomeShows offers “free admission” home shows in Kamloops, Salmon Arm and Vernon. 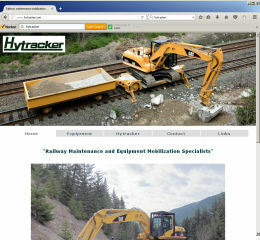 Hytracker Manufacturing Ltd. manufactures mobilization equipment for railroads and railroad contractors. Hytracker’s equipment is designed to quickly get equipment to rail sites and to quickly get off and on the tracks. 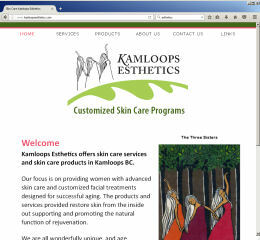 Kamloops Esthetics offers skin care services and skin care products in Kamloops BC. 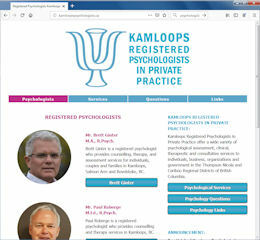 Kamloops Registered Psychologists in Private Practice offer a wide variety of psychological assessment, clinical, therapeutic and consultative services to individuals, businesses, organizations and governments in the Thompson-Nicola and Cariboo Regional Districts of British Columbia. 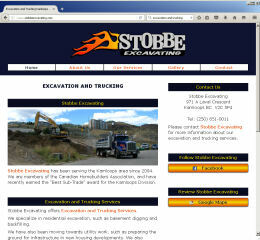 Stobbe Excavating is an excavation contractor that offers excavation, trucking and snow removal services in Kamloops. 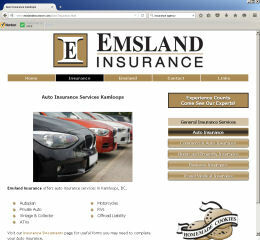 Emsland Insurance Agency is an insurance brokerage in Kamloops, BC. 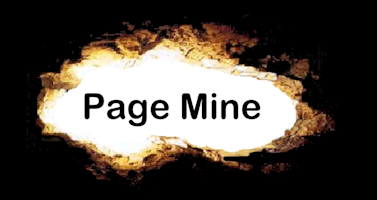 Our insurance agents offer general Insurance Services including coverage for Home, Property, Farm, Liability, Business, Commercial & Industrial Risks, Autoplan Insurance & Auto insurance for Commercial & Industrial enterprises. 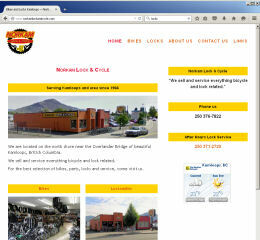 Norkam Lock & Cycle sells and services everything bicycle and lock related. 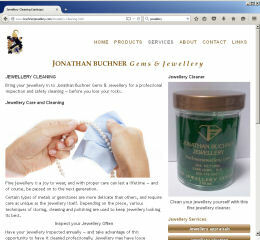 Jonathan Buchner Gems and Jewellery is a jewellery store located in downtown Kamloops BC Canada. 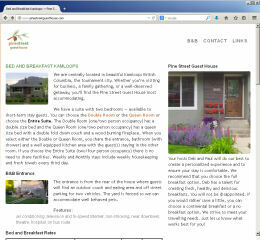 Pine Street Guest House is a bed and breakfast which is centrally located in Kamloops, BC. 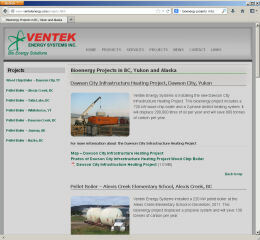 Ventek Energy Systems Inc is a fully integrated bio energy equipment and service provider. Ventek undertakes many bioenergy projects involving low pressure hydronic heating systems, low and high pressure steam heating systems, and biofuel drying systems for the commercial, institutional and industrial sectors in BC, Yukon and Alaska. Mishka Ranch offers ISOTASSU Registered Alaskan Malamutes in Kamloops, BC. 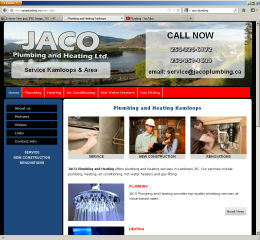 JACO Plumbing and Heating offers plumbing and heating services in Kamloops, BC. 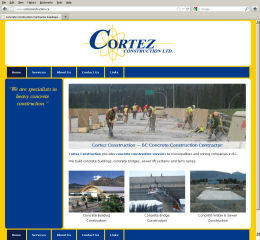 Cortez Construction Ltd. provides all forms of concrete construction and rehabilitation services to federal and provincial governments, municipalities and mining companies throughout BC and Alberta. 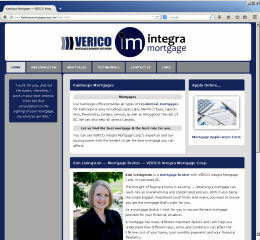 VERICO Integra Mortgage Corp. provides all types of residential mortgage financing for Kamloops and area including Logan Lake, Merritt, Chase, Salmon Arm, Revelstoke, Golden, Vernon, as well as throughout the rest of BC. 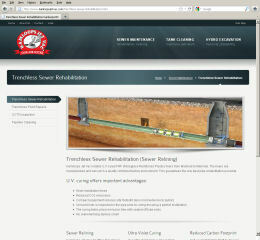 Kamloops Jet Vac offers sewer maintenance, tank cleaning and hydro excavation services in Kamloops BC. 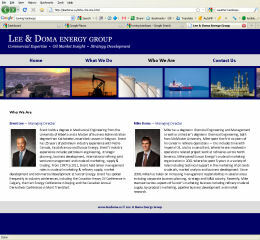 Lee & Doma Energy Group is a Calgary consulting firm specializing in oil sands development and crude oil marketing. 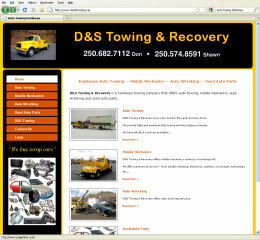 D&S Towing & Recovery is a Kamloops towing company that offers auto towing, mobile mechanics, auto wrecking and used auto parts. 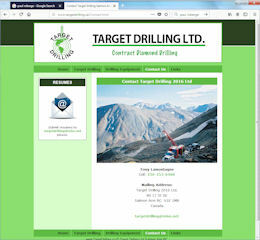 Target Drilling is a drilling contractor that specializes in diamond drilling projects throughout North America and specifically central BC. 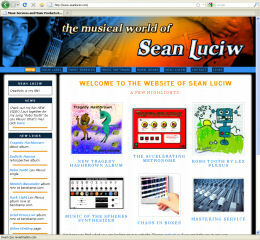 Sean Luciw is a musician who offers a variety of music services and music products from Kamloops BC Canada. 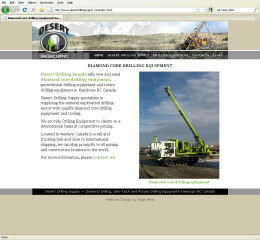 Desert Drilling Supply sells new and used diamond core drilling equipment, geotechnical drilling equipment and rotary drilling equipment in Kamloops BC Canada. 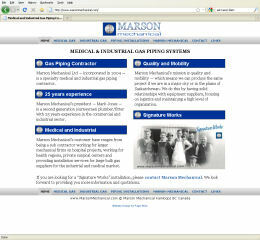 Marson Mechanical is a specialty medical and industrial gas piping contractor. 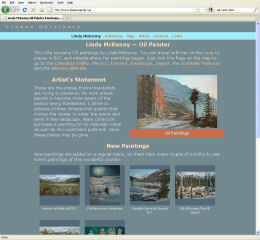 Linda McKenny is a multi-media artist who currently specializes in oil paintings of landscapes in British Columbia and Alberta. 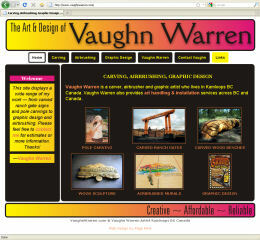 Vaughn Warren is a carver, airbrusher and graphic artist who lives in Kamloops BC Canada. 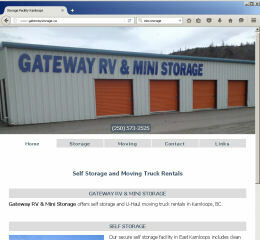 DeeJay RV Park & Campground provides short to long term holiday vacations in a 23 acre parkland setting in Barriere B.C. 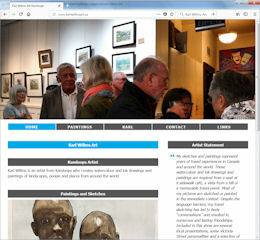 Check out the web sites we have developed for our clients. 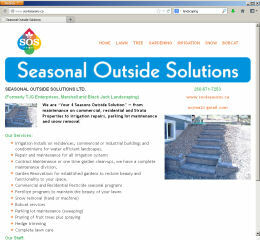 Please contact any of our clients for references.